Construction, real estate, and maintenance of these businesses are ever changing, growing more advanced almost every day. Technology is going just as fast and is making our lives better and safer with each leap. Buildings, homes, and bridges are coming up faster. However, with how fast they’re being built, they also have a small chance of failing. Infrared is a type of electromagnetic radiation that has longer wavelengths than visible light. Basically, it’s a type of light that we can’t see, but we can feel it in the form of heat. Visible light only makes up a small amount of the spectrum that we can see—light extends a lot farther than that. Temperature is a great way to distinguish this light. Back in the 1800’s, a man by the name of Sir William Herschel created an experiment with a prism. Shining a light through it, he created a visible rainbow. However, Herschel measured the temperature past the red shade of light and saw that it was still warm, thus showing that there was more light than we could see. This is exactly what infrared is—the light past visible red light. Then again, that’s only another small part of the spectrum of light. It extends farther and farther out, from gamma rays to microwaves and radio waves. Fortunately, ever since these experiments take place, there have been ways of developing technology that lets us see these waves of light. We’ve harnessed these rays for doctors see broken bones with x-rays, gamma rays for killing cancer cells, and infrared to see weaknesses in buildings and construction. 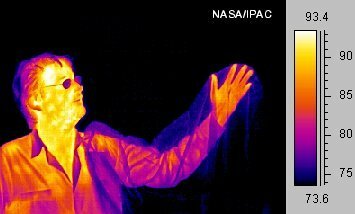 Infrared thermography is the use of different equipment or methods to determine the infrared transmission of objects or beings. In the case of this article, we will be looking at the use of such imaging science on homes and construction. Using this technology, it is easy to see failures of buildings, residential or commercial, and things that may be hidden to the naked eye. For example, if there are leaks or moisture problems in a house that you can’t see, these inspections will show a cooled area in a matter of heated infrared along the floor. This is a great way to see if there is any need for mold inspections or other problems that may require extra attention. Any lightened area can show something, be it leaks, drafts from a crack or shifted item, or failed insulation. Cameras might seem like magic and witchcraft, but there’s a very simple science to it. At its base, all these machines are doing is converting thermal energy into visible imagery that we can see. It’s the same idea as a video camera taking and converting light and displaying it on a screen—television or screen. Through this special capturing, we can see recordings and transmissions on these devices. Infrared cameras pretty much do the same thing. With the infrared energy that the person or object emits, the camera captures these signals and is able to display them on the screens. The temperature is directly proportional to the energy of something, so it is easy to see how certain problems or insecurities of a home or building. Temperature will be lighter if there are leaks, cracks, or imbalances around the home. New homeowners or business buyers should consider an infrared inspection. Why should I get an infrared inspection? Using infrared thermography, inspectors can pinpoint exact locations where problems might arise. Even things that are not completely visible to the naked eye, infrared cameras can show you things. With the use of these technologies, you can tell quite a bit about a building’s plumbing, HVAC, structural makeup, and even electrical wiring and systems. The things that infrared can tell you are things like pipe blockages in plumbing, overheating electrical circuits and wires, air leaking, and moisture accumulation. Suspicions of mold in the commercial building or house can be confirmed with infrared, too. Variations speak volumes when it comes to insulation and health concerns. With infrared technology, you can cut down on inspection times, repair times, and it can protect you from those that may want to take advantage of you. Testing areas that may have been worked on can show if they've been repaired or not, after all. It is a safe, easy, and harmless operation. It can show you things that you wouldn’t normally be able to see. Technology has come a long way and is ever evolving along with our construction and real estate. With infrared thermography, we can easily see problems that may occur. Whether in the structure or making of a building or home, you might not be able to see them. It is a great idea to get an infrared camera or have an infrared inspection every year or two. It helps to at least make sure that your electrical systems are in working order! Avoiding things like pipe bursts and mold build up is always good, too.